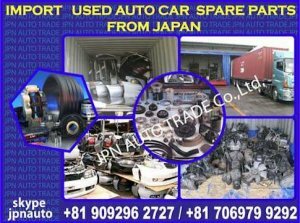 We can supply TOYOTA NISSAN MITSUBISHI HONDA SUZUKI IZUSU SUBARU, USED SPARE AUTO PARTS in 20 ft or 40 ft containers. Used spare auto parts, engine, transmission, vehicle computers, starter, alternator, AC compressor, power steering pump, fuel pump, door, bumper, muffler, drive shaft, dash board, head light, tail light, marker light, steering column, rack & pinion, suspension, gear box, brake assy, master & slave cylinders, window regulator, multiple switches & controls, audio & video components, mirrors, nose cut, front cut, half cut, chassis, car parts, used vehicle parts, OE & OEM vehicle parts, aftermarket & sports upgrade parts, Off Road 4x4 parts, specialty misc parts & accessories. JPN AUTO TRADE Co., Ltd.